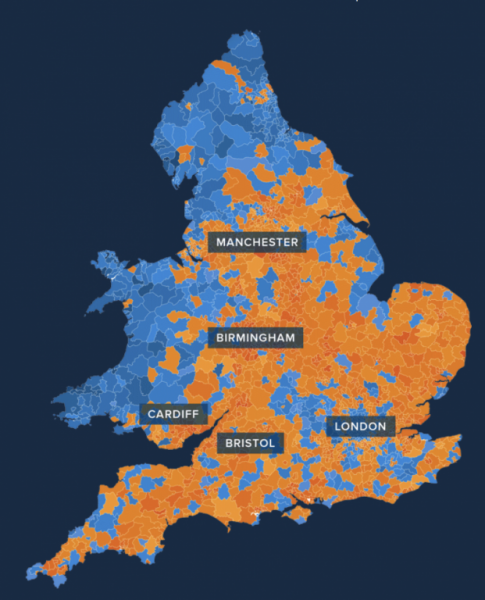 The best areas to sell a property are revealed as Bristol, Manchester and Birmingham, as London slump continues. Homeowners living in postcode district BS5 in Bristol, and M32 in Manchester, currently have the best market conditions for selling, according to PropCast’s September England & Wales House Selling Weather Report. The monthly study examines buyer demand for each postcode district, by counting the number of properties for sale and calculating the percentage of these that are under offer or sold subject to contract: 0%-20% is very cold, 20%-35% is cold, 35%-50% is hot and anything above 50% is very hot – portrayed as degrees. Top 10 Buyers & Sellers’ Markets, England & Wales. Unsurprisingly, London continues to dominate PropCast’s top ten coldest postcodes, where homes are in a buyers’ market. NW8 in northwest London is the coolest for the second month in a row, dropping one degree to six, whilst also seeing the biggest annual fall in buyer demand at 33%. L2 in Liverpool ranked second place at eight degrees, but recorded the highest growth year on year in buyer demand, at 33%. London postcodes make up the rest of England & Wales’ ten hardest areas to sell a property – all between eight and eleven degrees. Meanwhile SW10 and WC2 were the only London postcodes to record growth in buyer demand over the last year. Change in market heat Sep 2017 – Sep 2018 for Top 10 Buyers’ Markets, England & Wales. At a time where conflicting information about the housing market causes confusion to homeowners, the figures allow people to confidentially identify true local market conditions, and predict how easy or hard it will be to sell their home. PropCast’s creator and professional property seller, Gavin Brazg, comments; “By noting where’s ‘hot’ (sellers’ market) and where’s ‘cold’ (buyers’ market), PropCast can help homeowners determine how ‘quick and easy’ or ‘slow and hard’ it will be to sell their homes. With eight of this month’s hottest postcodes being in Bristol and Birmingham, these property markets are on fire. Homeowners here have it easier than elsewhere to sell as the balance of power is skewed in their favour because there are more buyers than homes for sale. Properties sell quicker and often after a bidding war as a result - as long as the initial asking price is set realistically. Both areas have appeared in PropCast’s top ten sellers’ markets for a couple of months now, so I expect this trend to continue in the short-term. “However, sellers in a cold buyers’ market, particular London, should not be downhearted because it’s still absolutely possible to sell well. Buyers are out there, as demonstrated by our analysis of how buyer demand has grown over the last twelve months. However, they’re more price and condition sensitive. The key to success is to identify the homes that are your direct competitors, and then position your home so it represents the best value for money. Foundered in 2005 by Gavin Brazg, TheAdvisory is the UK’s oldest independent advice and support resource dedicated to serving home sellers. By sharing insider secrets, TheAdvisory helps protect from the financial loss and distress caused by unethical industry practices. All members of the core team are serial house sellers and veterans of the UK residential property industry. Most of the team started within estate agency, and then moved into the corporate property sector specialising in asset management and developer part exchange services. As a collective TheAdvisory have been trusted to project manage over 6,000 residential property sales for the likes of; HSBC Bank, Barratt Homes, Taylor Wimpey, Investec, Lloyds Bank, McCarthy and Stone, Persimmon Homes, GE Money and Aviva. PropCast does not report on ‘off market’ properties. PropCast does not yet report on Scottish or Irish markets. 3rd party property market data specialists supply the raw data for PropCast. They provide a whole of market view of all publicly available properties across England & Wales by aggregating data from multiple sources.